An afternoon sky in Mexico is a brilliant companion to the ocean below. 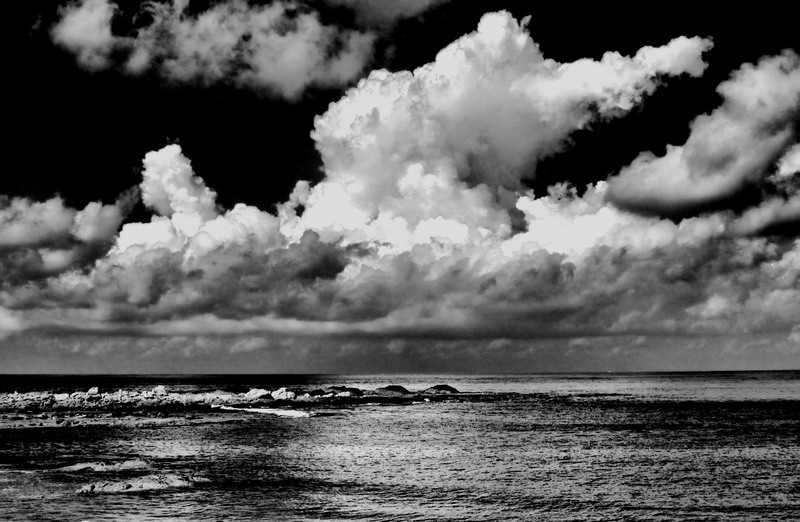 This entry was posted in Photography and tagged black and white photography, clouds, Life, mexico, oceans, Photography, sky, time, travel by Mike. Bookmark the permalink. It was and it still is. Thanks. Beautiful. Very striking and evocative. ‘Ello, Cat. Thank you my Canadian friend. Lovely thing to say. Thank you. Absolutely stunning. Did you use an infrared filter on this? No infrared, but some post processing for sure. Thanks! Mexico and Clouds, your photo is simply marvelous, you captured its essence, I remember it very well, sigh! Sigh, indeed. I love Mexico. Superb photo. As if the sky and sea are in conversation. They are symbiotic, yes? The clouds are largely due to the temporary loan of moisture given by the sea. I’m sometimes afraid you are going to steal all the beautiful shots and there won’t be anything left for the rest of us. Then I wake up. How funny are you. Thank you for the kind and generous sentiment. I am afraid to give Pumpkin a bone as I fear she will rip the bone apart. Get it? Wonderful landscape with dramatic clouds. Thanks. Your English is better than mine, Marylou. I like the idea of a fantasy paddle in marshmallow, but honestly, I would not know what to read into that, so I will go with nothing, other than your own nice imagery, Katie. Good man. It is a lovely photo that makes me wish I could fly! Quite a beauty there Mike! Moody and captivating – especially as I sit here looking out at the Atlantic under the super moon. Deceptive calm… that is, so beautifully peaceful until it’s not. I’d like to be looking at the Atlantic, right about now. I was born by the water, it’s in my blood. Nice to hear from you, Robyn. Muey bonita hermosa ocean with white billowing clouds. May I ask you from one photographer to another, how did you get the copyright symbol on your photos? My Galaxy S Relay smart phone might do it for all I know! Keep shooting those great shots! Google for the the symbol and then just copy and paste. Gracias. How did you do it on google? What did you say to the search engine? I have a lot of work ahead slapping that thing on my many photos. Most of the food shots are branded with my cooking site or other text. You are the bright spot in my day Mike. Trying to make the move from renting a room in a condo to having my own one bedroom nice apartment. Found the one, really nice for me. Now it is just paying the deposit, rental app, and organizing to move my furnishings from CA to NV. I have a good friend in LA who is gonna drive the moving truck for me. Know any good companies to hire men to move for pianos other than Labor Ready? Paulette, is your question where did I find the copyright symbol that looks like this © ? If so, just copy and paste it with your name and save it to your desktop. Than use it when you want to include it under one of your photos. Thanks for your email as well. It is gonna be pretty darn nice when all is said and done…I look forward to tomorrow when I meet Patrick & Carole the property managers. When I get done with the place, it will look like a page from a Better Homes & Gardens Magazine. It will be my 715 square foot oasis and palace. A very impressive photo, Mike. Thank you very much, Marion. I have always had this thing for dramatic clouds. Lately they’ve been amazing here in NYC. Love this photo. That would put me in some great company. Thank you very much. Yes sorry about the spelling of Ansel, new gadget decided to spell for me, The clouds colours and textures are just so..! His work has influenced mine. Thank you. Wonder if I’ll ever get to Mexico? Must be lovely to sit and watch the clouds and the water .. Hours and hours spent walking from bar to bar. Mostly beer, so I can continue to walk. Thanks Lauren. Who could not be inspired by a dramatic sky and beautiful ocean. I like what I like. I is who I is. Thanks.